Trees in urban and community settings throughout Colorado are going dormant, and they require care before and during the winter to remain in top health. Homeowners can take measures now and through spring to help their trees through the oncoming harsh conditions, says Keith Wood, community forestry program manager for the Colorado State Forest Service. Wrap the trunk. In Colorado, thin-barked trees like honeylocust, maple and linden are susceptible to sunscald and frost cracks because of drastic winter temperature fluctuations. 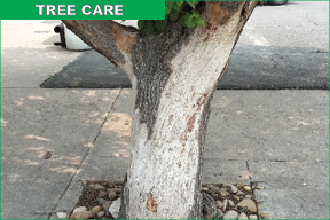 To prevent bark damage, wrap the trunks of younger trees up to the first branches using commercial tree wrap. Leave the wrap on until early April. Mulch the base. Apply 2 to 4 inches of wood chips, bark or other organic mulch near the base of the tree, but not against it, to reduce soil evaporation, improve water absorption and insulate against temperature extremes. Some community recycling programs provide wood chips free of charge. Recycle leaves. Instead of disposing of autumn leaves, consider layering them around the base of each tree as mulch, or blend them into the yard with a mulching mower to retain nutrients. Give them a good drink. Before storing the garden hose for winter, water trees in the area extending from the trunk to the extent of the longest branches. Water slowly, with a sprinkler or soaker hose, at the rate of 10 gallons per inch of tree diameter. Focus on younger trees. With less-extensive root systems, they require the most care. Wait to prune until winter. Late winter is the best time for pruning most tree species, but it can be done whenever trees are dormant over the winter months. Common reasons for pruning are to remove dead branches and improve tree form. Always prune just outside the branch collar - the point where a branch joins a larger one - and don't remove any branches without good reason. Wood says urban and other planted trees often also require additional, regular watering over the winter. During extended dry periods (e.g., more than two weeks without snow cover), provide supplemental water per the guidelines above. The best time for winter watering is on warmer days, when snow has melted off and the temperature is above 40 degrees. For more information about urban tree care, visit the Colorado State Forest Service website at http://csfs.colostate.edu.